A New York institution has consigned an intriguing Netherlandish devotional painting to Freeman’s sale in Philadelphia on February 27. 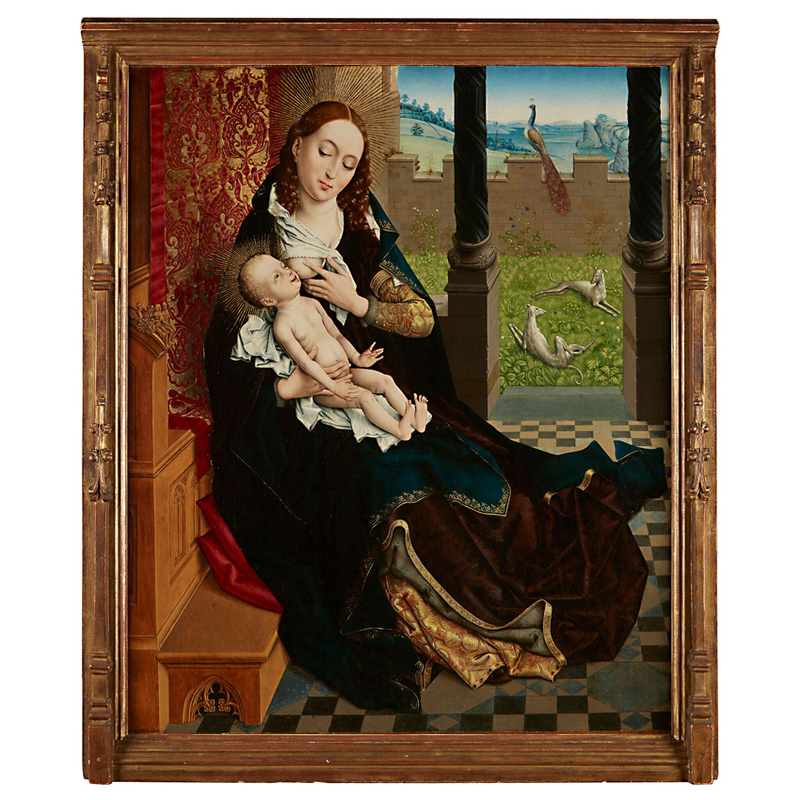 A Netherlandish devotional painting offered at Freeman’s in Philadelphia. One of only a dozen pictures ascribed to the Master of the Embroidered Foliage, it is estimated at $150,000-250,000. The small oil on cradled oak panel is one of only a dozen pictures by a workshop known only by the moniker Master of the Embroidered Foliage. The name was coined in 1926 by German art historian Max Jakob Friedländer (1867-1958), who likened the way the artist (or perhaps a group of artists active in late 15th century Brussels) painted the foliage in his works to the repeated pattern of stitches in embroidery. All known paintings depict the Virgin and Child in similar poses and – although minor alterations appear to the landscapes in the background – follow earlier works by the Brussels artist Rogier van der Weyden (1399-1464). Recently, the painting has been examined under infrared light revealing that changes were made to the background during the painting process. Originally, two standing figures were underdrawn in the area where a peacock, symbol of immortality, now stands. The two figures (probably Saint Anne and Saint Joachim, the parents of the Virgin) also appear in The Virgin and Child Enthroned, another painting that is attributed to the Master of the Embroidered Foliage, and now at the Clark Institute in Williamstown, Massachusetts. A view showing the underdrawing with two standing figures lying beneath the surface of the Netherlandish Old Master offered at Freeman’s. The last link in a long provenance chain painting beginning with The Spanish Gallery, London, 1912 is the New York University. It was given to the university by ambassador Ruth Farkas. Specialist Raphael Chateaux said that, given its age, the condition of the work (now housed in a 19th century gothic revival frame) is very good with only small areas of retouching to the sky. The estimate is $150,000-250,000 but it has already drawn speculation on twitter that it will make substantially more.